Dr Grahaeme Henderson is responsible for Shell's international shipping and maritime activities, including ships, barges, drilling units, floating production facilities and related operations. His work spans Shell's entire business across upstream, downstream, projects and construction. A Shell cargo is loaded or discharged somewhere in the world every 5 minutes. The 2,000 floating assets comprise some of the most technically advanced on the oceans today and includes the largest LNG shipping fleet in the world with 20% of the global tonnage. 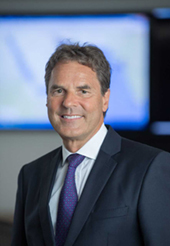 Grahaeme is a leading spokesperson on safety and the environment, improving the efficiency of shipping and maritime operations, and driving technology and innovation, including digitalisation. Grahaeme was the President of the UK Chamber of Shipping from 2016-2018 and Chair of the Oil Companies International Marine Forum from 2014 to 2018. He is a member of the World Economic Forum's Global Agenda Council on the Oceans and an Adjunct Professor for Southampton University, UK. He has been appointed by Her Majesty's Government to the Expert Panel for Maritime 2050. Grahaeme was previously Country Chair and Managing Director of Brunei Shell Petroleum, Shell's joint venture company in Brunei. His career with Shell includes over 20 years working overseas on assignments in Brunei, Nigeria, Syria and The Netherlands. Born in London, he has a First Class Honours BSc Degree and a PhD in mathematics of sea waves, has recently been awarded an honorary DSc, and is a Professional Chartered Engineer. He is married with a daughter and twin sons.